Is there a fourth option of bush camping in tassy? Ie, is it practical to plan on bush camping in tassy or is it all too hard? Sorry Dave but why are you bush camping in the suburbs, that's a bit odd. Dave this is something Ratty was looking into, if he doesn't pickup on this topic I will give him a call. I know there is a pub site down Stanley way that has free camping but is maybe 1/2 hour drive from recommended caravan park. Thanks MMD, want to experience as much as the real tassy as possible. Busy right now but will pick up on this tomorrow. Topic split from the Devonport accommodation thread. 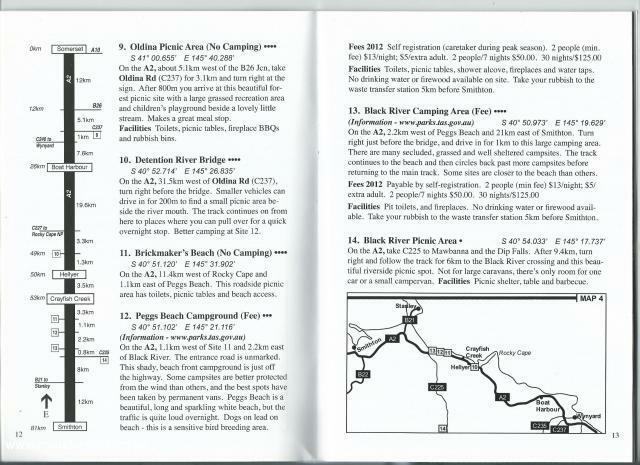 There is a fourth edition of free camping Tassie which was released in 2012. I have only been in Tassie for 3 years so I am certainly not a local but have had a bit of a look around since then. Please find attached the excerpt from this publication for the Stanley area. There is also a free camping site at the rear of Rocky Cape Tavern. Asks for a small fee for showers and toilets. I did drive in last year and it looks ok, not sure about pets. The site at Black River I have also looked at, it is quite large and spaced out, quite basic but also looked ok. Can throw a line out there I reckon. As you may have noticed, most camping in Tassie is not quite free but obviously cheaper than other options. The word has got around with the nomads so all the really free options are usually well patronised. Both these sites mentioned are less than 30 mins from Stanley or less for the revheads. Feel free to keep asking questions and I will try to find out the answers.